This high QUALITY official manual for Ferrari 550 Maranello 1996-2001 is 100 percents COMPLETE and INTACT, no MISSING, CORRUPT pages, sections to freak you out! This manual is exactly as described. It is in the cross-platform PDF document format so that it works like a charm on all kinds of devices. 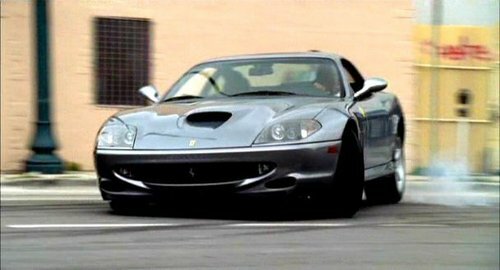 This highly detailed workshop service repair manual for download contains virtually everything you will ever need to repair, maintain, rebuild, refurbish or restore Your Ferrari 550 Maranello 1996-2001 (ALL MODELS ARE COVERED). All diagnostic and repair procedures and gives you access to the same information that professional technicians and mechanics have. You can view and print out the complete repair procedures with this workshop service repair manual Download - you do not need to be skilled with a computer. Switch the engine off, disconnect the oxygen sensor and the idling speed adjuster. Start the engine, select the parameter page on the diagnosis system and make sure the rotation speed is 900 rpm. If the rotation speed isn't correct, balance and take the engine to the correct speed using the by-pass (Fig. 42, Re. 1) and checking if the TL value (SD 1) and the mercury columns are the same for both cylinder banks. Considering that the throttle body flowing system has been made correctly in the factory, we deem it unsuitable acting on the throttle stroke adjuster to balance and settle the idle speed (Fig. 42, re. 2) . 1 - Tighten the by-pass adjusters (Fig. 42, re. 1 ). 2 - Bring the idle speed to 850 rpm by balancing both cylinder banks, through the throttle stroke adjusters (Fig. 42, re. 2) . 3 - Open the by-pass adjustment screws balancing both cylinder banks and set the engine at 900 rpm. 4 - If an adjustment is made on the throttle stroke adjuster, you must check and possibly modify the potentiometer adjustment, loosening and turning it (adjustment possibility of approximately 2): it must be adjusted with absolute angles included between - 1 and 3 (corresponding to 400k600 mV). The maximum difference between these values must not exceed 2.1 (corresponding to 70 mV). Note: if the idling adjustment is exceeded (i.e. the advance is 4.5" at idling speed) while adjusting the potentiometers, the throttle stroke screws or the accelerator control cable, switch the engine off (so that the Motronic system doesn't store wrong data) and repeat the previous procedure. 5 - Check, by means of mercury columns, if both banks are balanced even during progression, increasing speed progressively up to 2,500 rpm. If an adjustment is required, act on the throttle cable adjuster (Fig. 42, re. 7). - Place the car on a lifting bridge. - Put the rear part on two small blocks and remove the rear wheels. - Remove the complete underbody flatbed. - Remove the gearbox axle shafts. - Remove the oxygen sensors. - Disassemble the central exhaust pipe assembly (catalytic converters, silencers and connecting pipes to rear silencers). - Remove the gearbox control rod. - Unscrew the fastening nuts of the engine-gearbox connecting pipe on the clutch housing. - Unloosen both nuts fastening the gearbox supports. - Using a column jack, position it under the gearbox assembly and lay the whole unit. - Make the assembly retract as much as possible and remove it from the chassis with the engine-gearbox connecting pipe. - After detecting the shim of the spacer 13 determining the pinion/crown contact and of the spacer 14 determining the pinion preload, start the gearbox assembly.